After making strides in the electric car market, Nissan has set its sights on the home. The company recently debuted its redesigned Leaf electric car and continues to push its xStorage battery, but now it wants to combine its two great loves under one roof. That's what the Nissan Energy Solar scheme -- the company's complete home energy solution -- is all about. If that sounds familiar, it's exactly what Tesla is doing in the US with its own all-in-one scheme, which is expected to hit 800 Home Depots around the country. The difference with Nissan's proposed solution is that it's currently only available in the UK, where rain, fog and generally inclement weather are stereotypically common. Nissan says that its panels are designed to operate in bad weather, storing power in recycled Leaf batteries. Stored energy can then be used to power the home and provide an alternate means of fuel for the e-NV200 and Nissan Leaf. There's a global push for cleaner methods of energy production, and the 13,000 people who pre-ordered Nissan's Leaf EV (check out Engadget's test drive here) are testament to that. On the home energy front, more than 800,000 homes around the UK are already taking advantage of solar power, so there's definitely room for millions more customers. 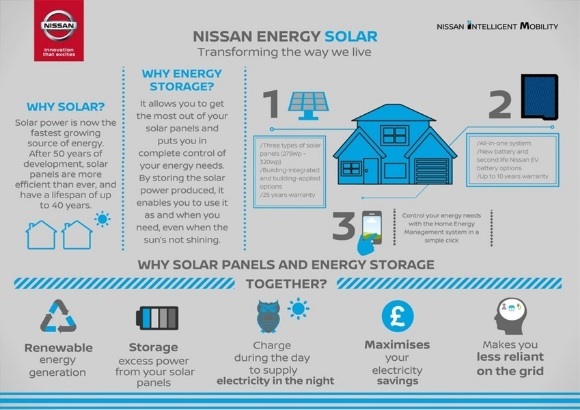 Apart from giving consumers some level of independence from national electricity providers, Nissan says its Energy Solar scheme will shave 66 percent off electricity expenses -- that's when opting for the six panel system which costs £3,881(roughly $5,200). Nissan is also offering customers some degree of flexibility -- there's a full package that integrates energy generation, management and storage, but the components are available individually too. At any rate, this seems like an appealing solution for those interested in reducing their carbon footprint and investing in renewable energy.